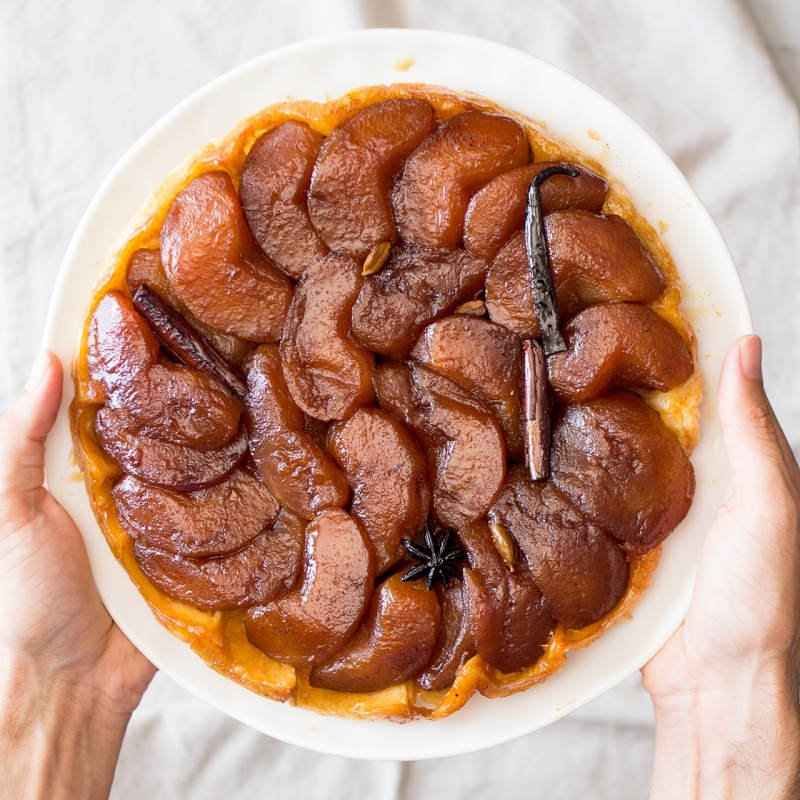 Now that autumn is finally here, we have a classic French recipe to share with you: vegan tarte tatin. This dish marries up apples, autumn spices and brandy and presents them on a deliciously flaky pastry crust. This dish is so wonderful because you get that amazing apple pie experience without all the difficult and intricate pastry work that sometimes comes with making an actual pie. 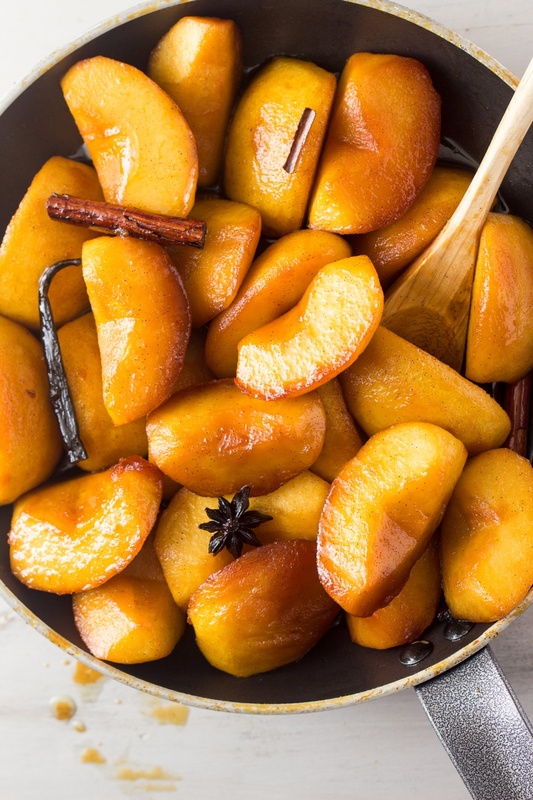 You just bathe the apples in some olive oil, maple syrup and spices, whack a sheet of puff pastry on the top of the pan and stick it in the oven for 30 minutes… Turn it upside down and you have a rich autumn dessert that you won’t be able to stop eating! A lot of you will be thinking that it might have been difficult to ‘veganise’ a dish that traditionally involves apples cooked in butter and is served on puff pastry (which is traditionally butter and flour). Firstly, most puff pastry that you find in the supermarkets (like Jus-Rol or Pepperidge Farm*) is actually vegan as they replace butter with vegetable oils to reduce costs. 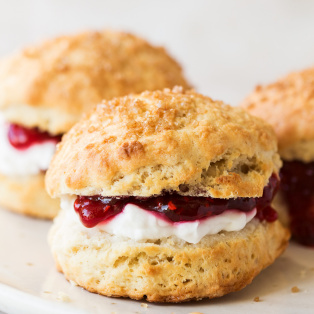 Ironically, vegans get a lot of criticism for finding imaginative alternatives to ‘old school’ cooking, but a lot of the time most store-bought processed versions of cakes and sweets deviate even more from the original recipe! To make the rest of the recipe vegan I substituted sugar for maple syrup and butter for olive oil. 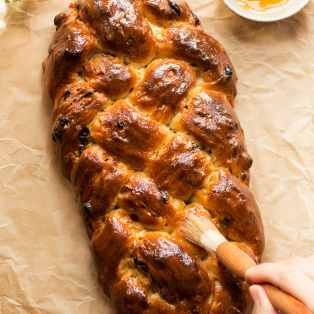 Because butter typically brings richness, I decided that I needed to be on my ‘A’ game for this recipe, so I added in some autumnal spices, vanilla and brandy, just to give it an extra kick. 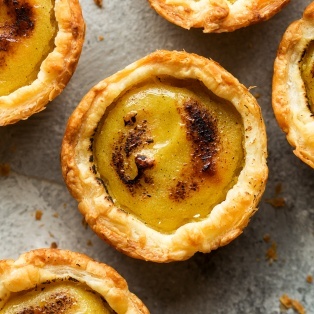 The trick with this recipe is getting the fruit to the point that, by the time you take the tart out of the oven, the fruit holds together but is right on the cusp of breaking up. Ideally, you should be able to cut through the apples with a spoon very easily. We went for a very dark caramelisation on the fruit, so our version is not massively sweet as the sugar loses its sweetness when the caramel is darker. If you want a sweeter tart you could achieve this by not letting the sugar turn as brown (4th step) which would also result in a tart that was a lot lighter in colour. 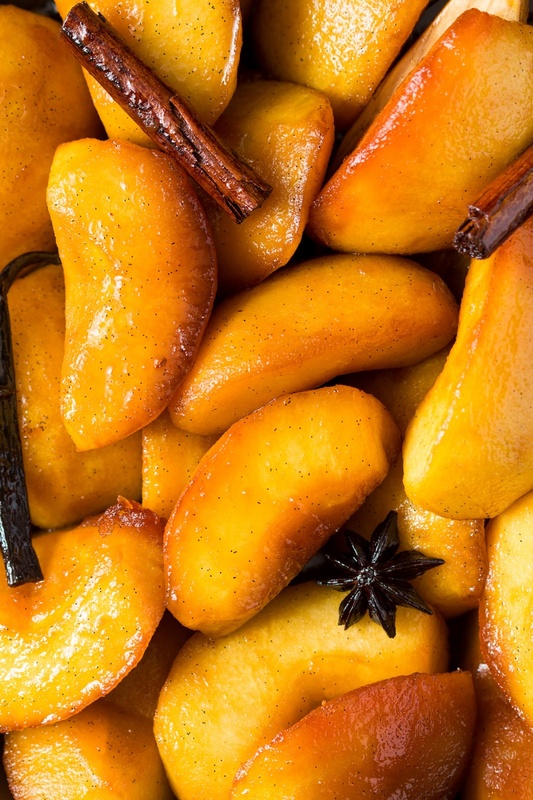 However dark your finished product, this is amazing as an after dinner autumn dessert and perfectly respectable as an afternoon snack to have with coffee. Enjoy! PS: If you make our vegan tarte tatin, don’t forget to tag us on Instagram (#lazycatkitchen). 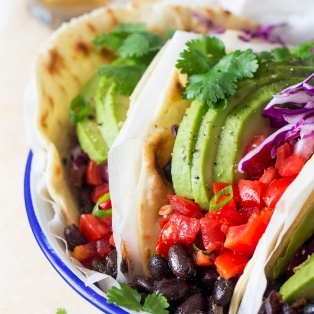 We love seeing your takes on our recipes! Peel the apples, cut them into quarters and cut out the core using a pairing knife. Put the caster sugar or maple syrup, olive oil, star anise, cardamom pods and cinnamon stick into a 24 cm / 9.5″ ovenproof frying pan / skillet. Scrape the seeds from the half a vanilla pod and put them and the pod itself into the pan. Place on a medium heat and give it a good stir. If using sugar, the mixture will look like an olive oil granita until the sugar melts into the oil. After a few minutes of gentle bubbling, the mixture will separate, turn an amber colour and start to bubble more vigorously. Watch the mixture carefully and the minute the sugar turns dark amber (don’t push it too far as it will burn), take the pan off the heat. Add the cut apple pieces into the pan gradually, coat them in the caramel mixture and start to simmer on a low heat. As the apple starts to shrink you should then be able to fit all of the apple pieces in the pan. Caramelise the apples for another 15 minutes until they turn golden. 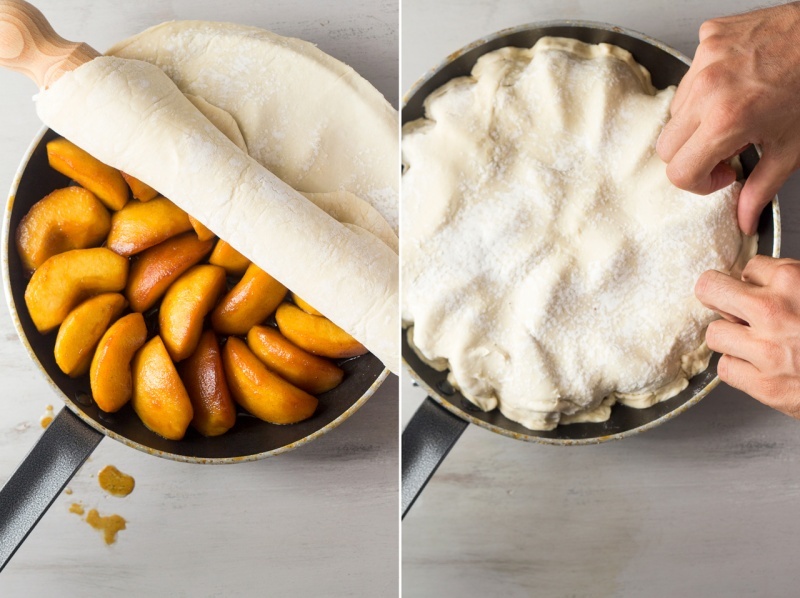 Move the pieces around the pan so that they caramelise at the same pace. The sides touching the pan will cook quicker so if some pieces look more done than others, remove them from the pan and set aside on a small plate so that the other pieces have a chance to catch up. Add brandy and simmer for another 10 minutes (until the apple pieces are the same colour as the 2nd and 3rd photo). By the end, the apples should be pre-cooked enough that you should be able to insert a skewer into the flesh with a considerable amount of resistance. Preheat the oven to 200° C / 390° F.
Leave the apple mixture to cool for 15 minutes so that you can handle the apples with your hands. At this point arrange the apple pieces on a side, in a spiral shape. 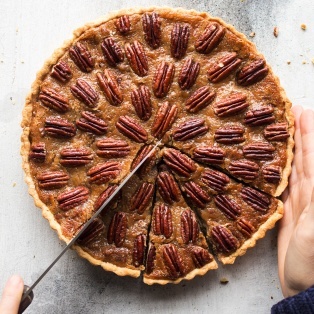 Make sure the cinnamon stick, cardamom pods, vanilla pod and star anise are on the pan itself so they can be removed easily once the tart is cooked. Roll out the puff pastry to 3 mm / 0.1″ and, using a plate that is slightly larger than the pan, cut out a circle of pastry. Drape the pastry over the pan and make sure you tuck in all the edges down the side of the pan. 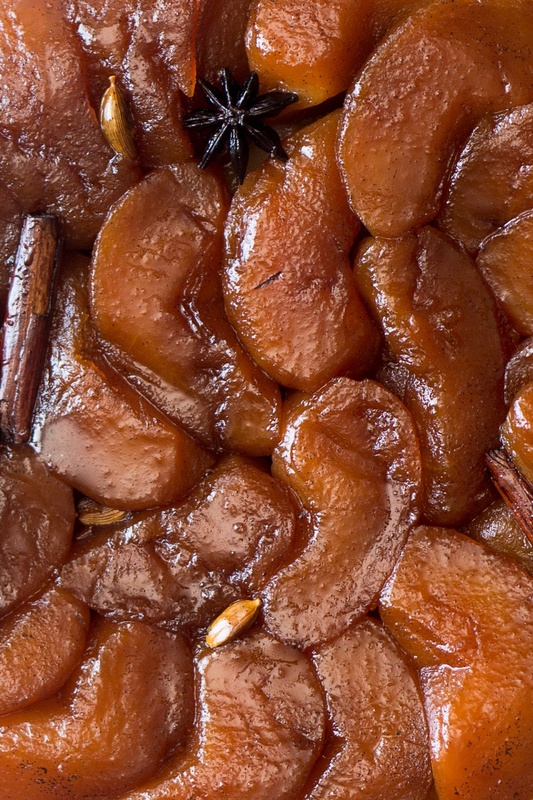 This will give you that rustic tarte tatin crust. Pierce the pastry 3-5 times with a skewer to allow the steam to escape and bake in the oven for 15 minutes. Turn the oven temperature down to 180° C / 355° F and cook for a further 15-25 minutes until the pastry is golden brown. Be careful not to burn yourself when removing the pan out of the oven as the pan’s handle will be piping hot. Serve on its own or with some vanilla ice cream or crème fraîche. This looks really good. I am getting more apples in my CSA this week so I definitely will try this. Thanks! Thanks, Jeannie. That’s so nice to hear! Hope’ll love it! 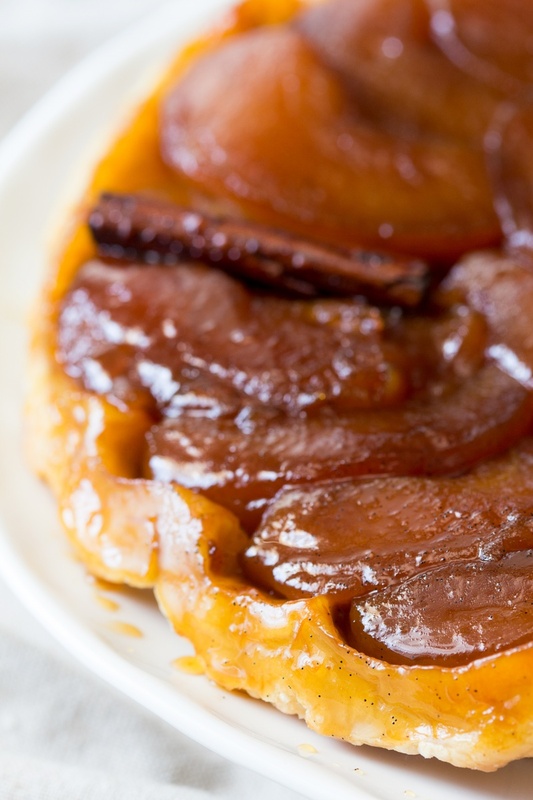 I love nothing more than my mums classic apple tart tatin! But I might have to give this a go. Nothing ever beats mum’s cooking, does it? 😉 Hope you’ll like it! This is absolutely gorgeous! Love the photos. I’m about to make a vegan tarte tatin myself (apricot) and stumbled across this whilst looking for inspiration. I’ll have to give your recipe a try when apples are in season in Australia! Thanks, Bek! That’s so nice of you to say! 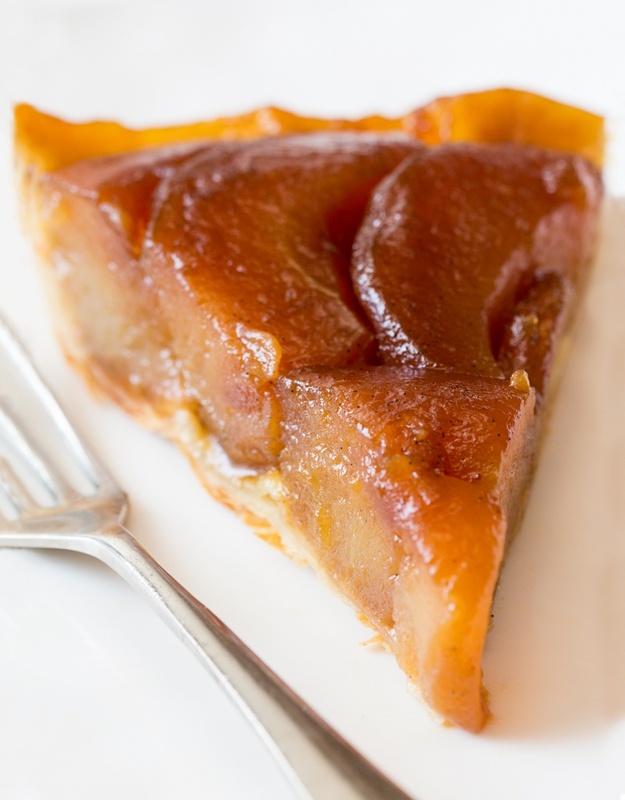 Apricot tart tatin sounds like a dream, especially that it’s depth of winter where I’m now! I am a big fan of Tarte Tatin and a favorite dessert whenever I am eating out (I live in Paris) or I have the luxury of cooking time. 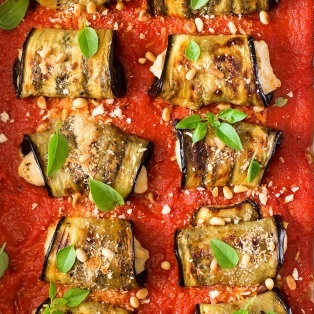 I am however not a vegan, and never tried “veganising” dishes. But your tarte tatin looks delicious and perfect. I must say the picture is just as good as the non-vegan ones with lots of butter that we get here in Paris. Congratulations and keep cooking such lovely dishes.